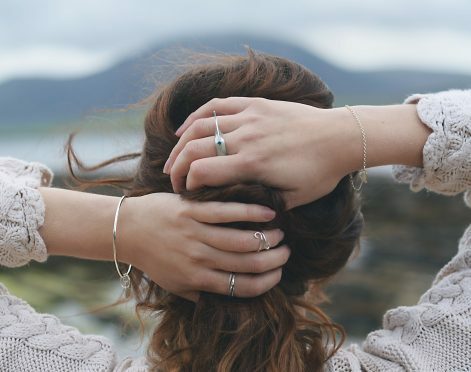 From diving in Borneo to the wild waters of Orkney, jeweller Zoe Davidson has always had a love for the sea. Zoe Davidson, 25, has lived near the sea since she was young. 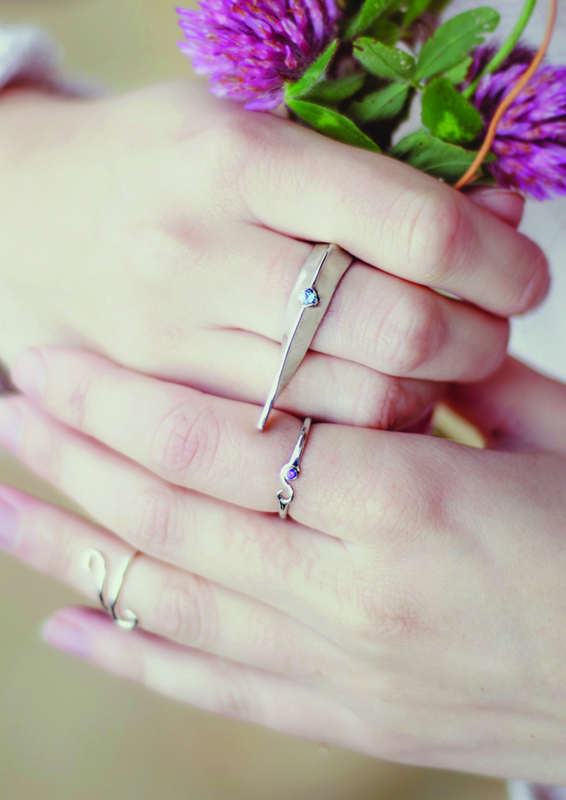 She was born on the island of Borneo in South East Asia but now lives in Orkney where she creates her own pieces of jewellery, inspired by her natural surroundings. How did you end up on Orkney from Borneo? My dad worked as an architect and my mum, a teacher. They met through a scuba diving club, and on a trip sleeping over on an island, one fell into another’s hammock and that’s where it all began. Me and my sister were raised alongside my parents while they dived, sometimes under their arm sharing their air. We were brought up loving the sea. Dad is Orcadian, and we were always going to move back to the UK. I moved to Orkney when I was 13 and what a change it was. The cold, blustering winds and rugged landscapes. It did shock me at first but I have grown to love the place. Ever since I remember I have always been building things, drawing and painting. I think I sold my first painting when I was eight years old. My parents have always been encouraging of my creativity. On our travels around Asia we’d go and visit the traditional crafts, from Sarawakians carving intricate patterns in wood to the Thai dabbing egg shell on to lacquered bowls. I believe seeing this hands-on craftsmanship at such a young age has inspired me. Why did you start making jewellery? Initially I made extravagant body sculpture and theatrical costume props. Must have been due to my love for sci-fi films! The body was always a starting point for my designs, seeing how shapes would sit and change its shape. I scaled down to smaller items of jewellery because I like seeing and hearing of people wearing my items and how it makes them feel. It gives me a great sense of achievement. How easy is it to run a business from Orkney? Being a small community, people like to share and help each other out. This is exactly the same in business here, so you never feel stuck or alone. There is always someone to ask. Also, being part of Orkney’s Craft Trail has done wonders. 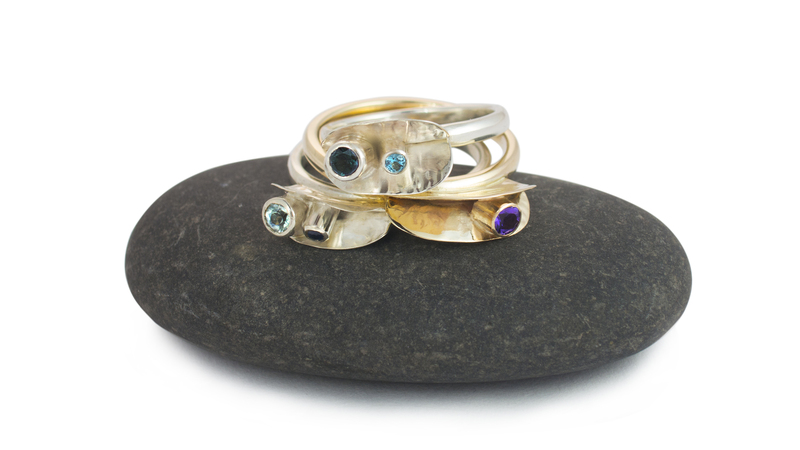 It allows customers to come visit me at my workshop and see how the jewellery is made. It shows there is a real person behind the work making it by hand. It is also good for me as jewellery making can, at times, become quite isolating working on your own all day. So it is a chance for me to meet people and tell the stories behind my work personally. The seas and coastlines around Orkney. The sea is a place where I can go and think. The shear shapes and colours of the waves drives me to create such dynamic jewellery, whilst Orkney’s marine history tells an important story behind my most recent collection. I cannot help but find simple shapes and patterns on the coast that people may not see, so inspiring. How the sea has carved the coast and made art in itself. 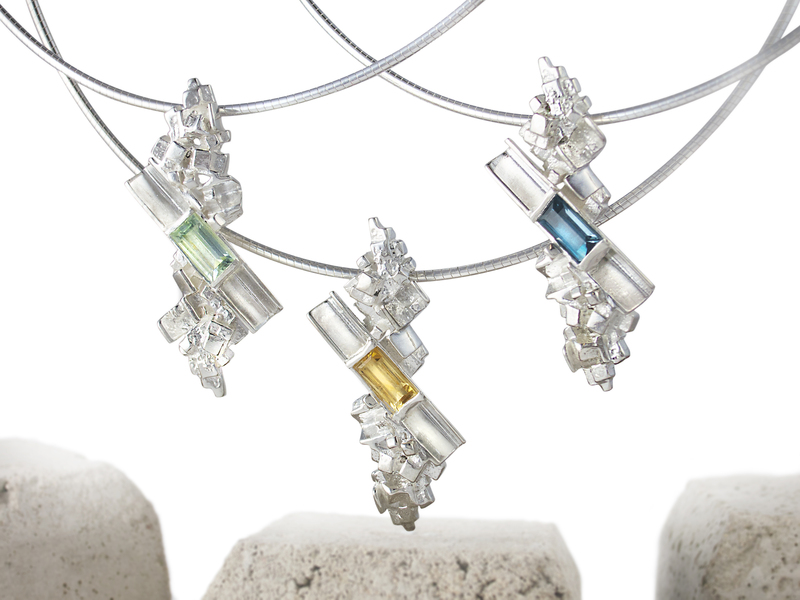 Coloured semi-precious stones helps to act as a focal point, inspired by the turquoise blues of the sea and warm yellows of the sunset’s reflections. Their placement is important to create flow in the pieces and highlight similar shapes I have seen. Tell me about your process of making a piece. Firstly, I like to visit the actual site of inspiration and get a feel for the place. Looking for shapes in the ground and overall forms in the distance. In my head, I like to think up designs as I am walking along, elongating lines; exaggerating curves. I take wee snaps of the whole thinking journey and take them back to the workshop. Sketching and developing is the next step. Sketching designs helps me come up with new ideas and allows me to experiment. I like to then create prototypes of designs in paper or copper, allowing me to evaluate any weaknesses or strengths. I love prototyping with the fold forming technique as it is, at times, unpredictable which can spark further design ideas. Gemstones come in later if I feel there is a need for a focal point. For some reason, it helps if I squint at a design or prototype to see if a gemstone would balance the overall composition of the piece. 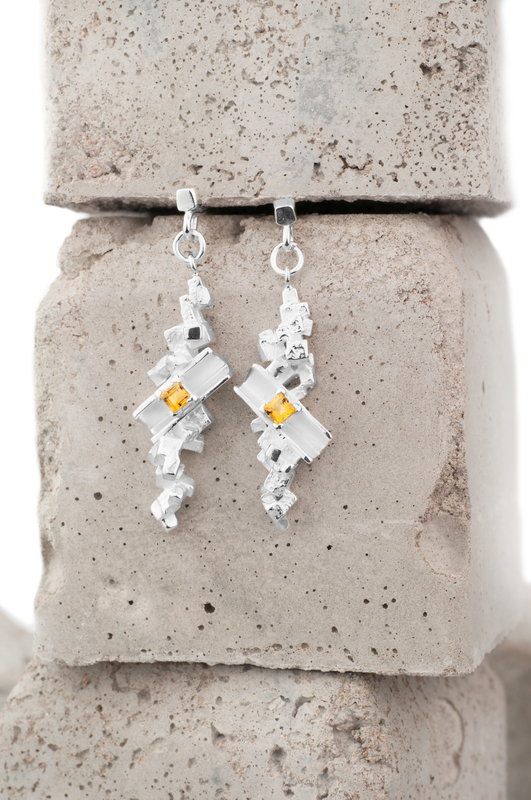 After numerous designs and prototypes, I move forward into precious metals. It has to be the Orkney Wave Collar. It is an extravagant neck piece using the fold-forming technique to its full potential. It is probably for someone who is confident and likes to make a statement in a room. 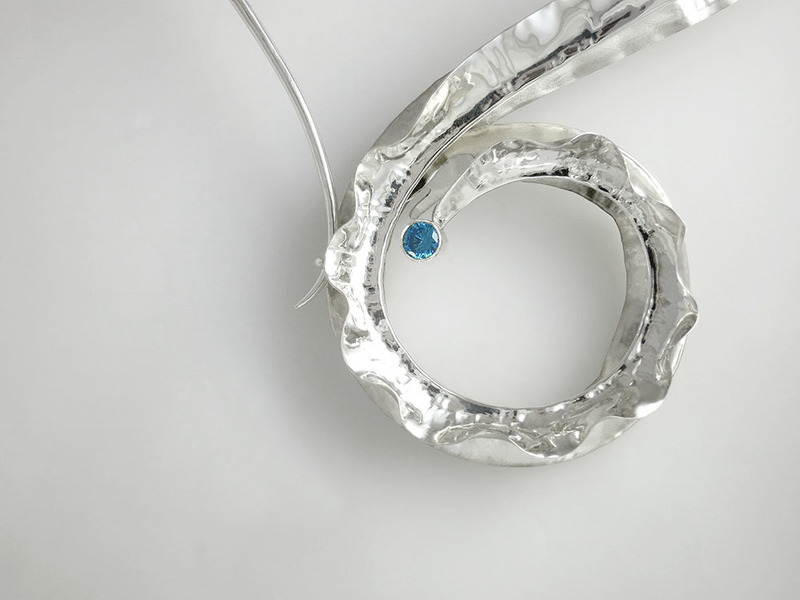 Its flowing, rippling form is inspired by a wild sea, with a gorgeous blue topaz gemstone being the eye of the storm. It is definitely something you should wear on its own on a simple black dress so it can really shine. Why should people choose hand made jewellery? When you buy something hand made it usually lasts a life time and tells a unique story. You buy into the quality when you buy hand made as the maker cares for each piece. And even if the item does get damaged, you can go directly to the maker and get it fixed. With hand made items comes a personalised service. 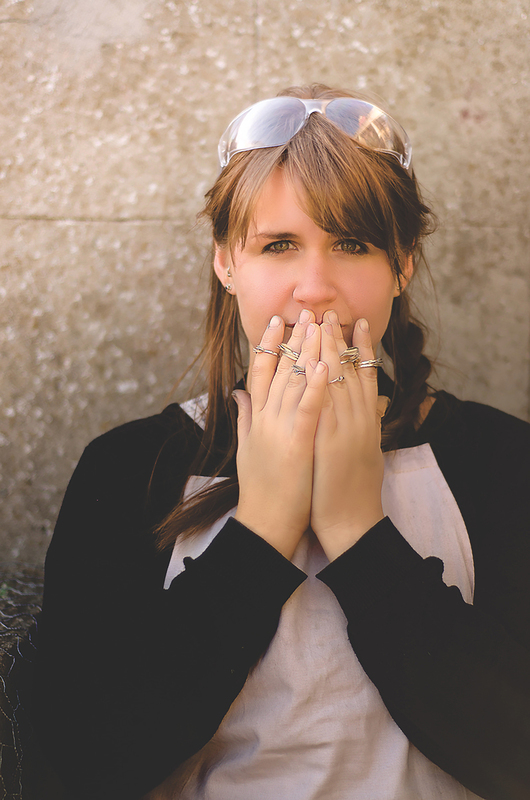 But, dig a bit deeper as buying hand crafted jewellery keeps these traditional hand skills alive. Where would we be without them?